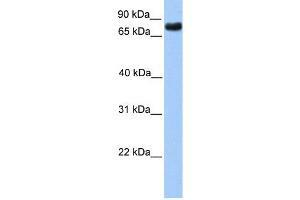 Characteristics This is a rabbit polyclonal antibody against TLE2. It was validated on Western Blot using a cell lysate as a positive control. Background TLE2 belongs to the WD repeat Groucho/TLE family. It contains 6 WD repeats. TLE2 is a transcriptional corepressor that binds to a number of transcription factors. It inhibits the transcriptional activation mediated by CTNNB1 and TCF family members in Wnt signaling. The effects of full-length TLE family members may be modulated by association with dominant-negative AES.